- Publisher For decades, millions of Christians have discovered William Barclay's Daily Study Bible to be the ideal New Testament commentary series for both devotional reading and serious Bible study. Now, carrying foreard brilliantly the pattern established by Barclay, The Daily Study Bilble has been extended into a coverage of the entire Old Testament. Invaluable for individual devotional study, for group discussion, and for classroom use. The Daily Study Bible now provides a useful, eliable, and eminently readable way to discover what the Old Testament writers were saying then and what God is saying today. 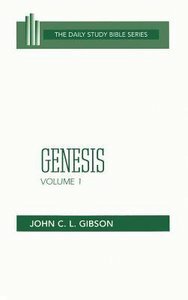 About "Genesis (Volume 1) (Daily Study Bible Old Testament Series)"
John C.L.Gibson is Emeritus Professor of Old Testament within the School of Divinity at the University of Edinburgh, he was the General Editor of the The Daily Bible Study Old Testament Commentary Series to which he contributed volumes on Genesis1-11, Genesis 12-50 and Job. He has also written many books on Semitic texts incuding Davidson's Introductory Hebrew Grammar -Syntax, Canaanite Myths and Legends and Language and Imagery in the Old Testament. He served as president of the Society for Old Testament Study in 1984 and is presently auxiliary minister of St. Philip's Church, Joppa.-Editorial Review.